Ten June: Party Planning HDawg's First Birthday Party! super cute! cant believe its been an year! Love it! My girls loved that book when they were little. It is one of our favorites to give as a gift to new parents. My son LOOOVES Chicka Chicka Boom Boom! We even have it on a CD that I play in the car and it makes him laugh all the time. 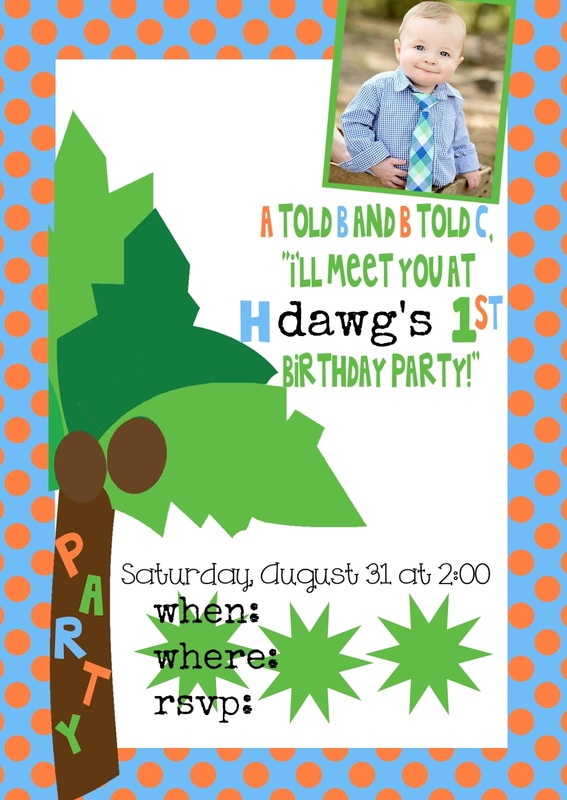 His first birthday isn't until December, but I'm already planning his party in my head. I think we're going with Mickey Mouse Clubhouse though. This is such a great idea! I especially love the invitation! I can't wait to see! We did a "Little Man" theme for Cayden's birthday last month. I tried to focus on the neckties instead of the mustaches just because that's my preference and Cayden's monthly growth stickers were in the shape of neckties. It turned out so cute and we had a great time. So many emotions surrounding 1st birthdays. It's as much a party for you as it is for him since you remember those birth details like they were yesterday! Enjoy your day!! Looks like it's going to be a blast! I'll have to check out that book for Jack! Happy Birthday to your little one...and congrats to Mommy and Daddy for surviving the first year :) Enjoy the party! BTW- we did a First BEE-day for my son: http://vtmamateurs.com/2012/02/23/super-sweet-1st-birthday/ ...and I am already scheming up my (4 month old) daughter's first birthday- so much fun!